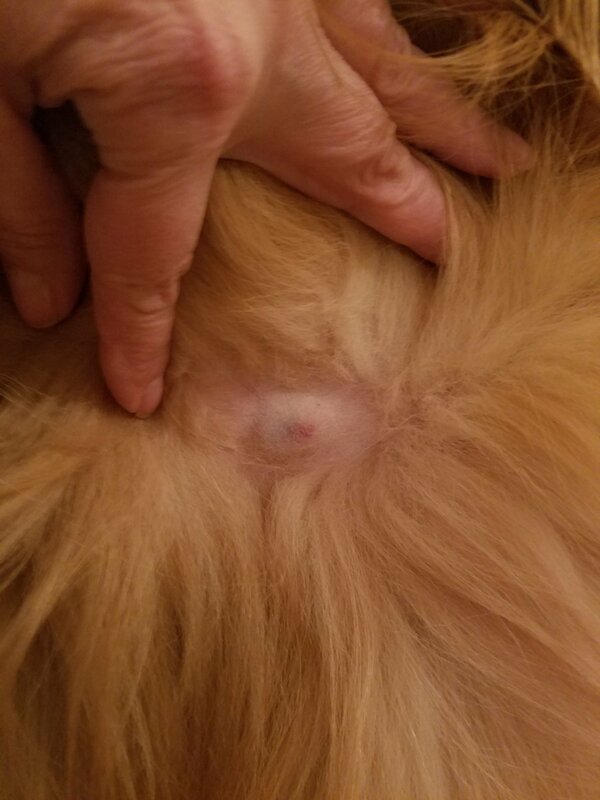 My dog has a 1/2" lump on the lower part of his neck left side closer to the chest. It feels somewhat hard and has some discoloration under the skin. You can pretty much feel all around it. My vet aspirated it and the findings are, micro description: this sample has thick droplet hemorrhage with elements of blood and small amount of keratin/squamous cell debris. there are a few vacuolated macrophages & occasional individual spindle cell. no overly neoplastic cell or infectious agents. findings: hemorrhage and nonsuppurative inflammation.This is essentially hemorrhage, it may not be representative but it could also be hematoma, hemorrhagic cyst, hemangioma other blood filled structure or poorly exfoliating sarcoma/vascular tumor. recommend re-aspirate or biopsy. here's a pic of the lump. the redness is from the needle aspirate. It was not red prior but the slight discoloration was there prior. Now this is a tricky situation for Kodi as the cytology results aren't very conclusive. Often aspiration samples will have blood in them (even when they are not hematomas), so that may be completely incidental. That said, the spindle cells are a concern. They are a frustrating cell to assess on microscopy because we can see them present in lesions where there has been inflammation/trauma (as they help form scar tissue) but also can see spindle cell based tumors. And where some cancers look clearly abnormal, spindle cell tumors often do not. So, even if this is aspirated again and more cells collected (the vet should be aiming for solid part of the mass to harvest more cells if they think it is blood filled) there is a significant risk that the pathologists won't be able to be any more definitive about the spindle cells. As well, in regards ***** ***** question, a perivascular wall tumor (aka hemagiopericytoma) or hemagiosarcoma will often be blood filled as both are tumors of the cells that line blood vessels. Therefore, in this case, if there is a chance its just a hematoma, consider warm compressing it +/- trialing anti-inflammatories. If it doesn't reduce as a hematoma should, then we'd have to think about those other causes and in that case you may wish to just have the mass removed in whole (as it will take the same anesthesia one would need for biopsy) so we can determine what it is but also get it off him instead of risking needing to do so anyway post biopsy. we got cut off, can you call me back? My dog is a pit bull. The sac has been there for three months. dog: lumps is about the perimeter of a cup...seem to bother him.